If you’re annoyed when you land on a website’s 404 page, odds are your visitors feel the same way when they land on one of your own error pages. According to The Good, people land on several million 404 pages every year and more often than not, that traffic is lost because the visitor abandons the site to try another result. While there’s no formal estimate for the number of lost sales caused by consumers landing on 404 pages, we can assume that it’s extraordinarily high. 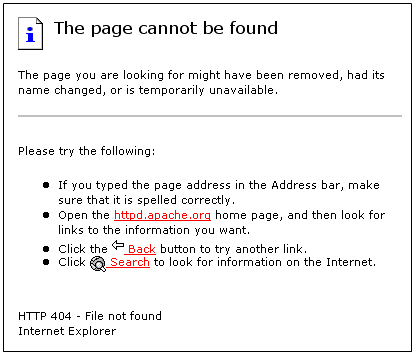 The good news is…404 pages also represent opportunities. “When someone lands on your 404 page you have their attention,” says The Good. 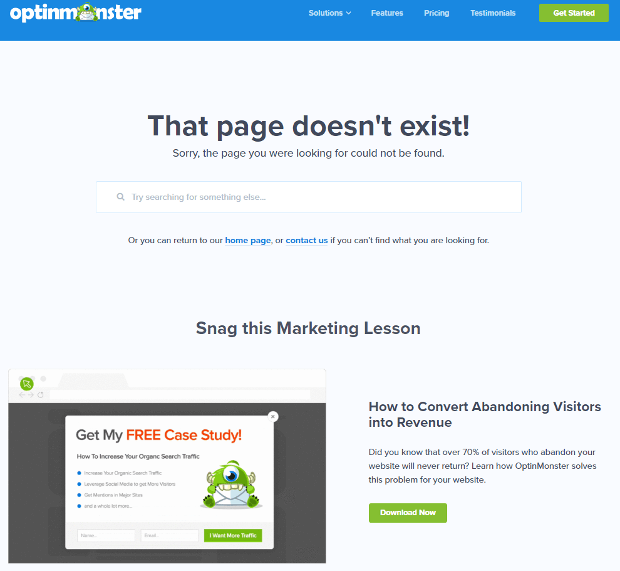 “How you use that attention is directly related to how successful your site is in converting visitors.” Companies like OptinMonster, for example, have optimized their 404 pages and turned lost visitors into loyal customers. But before we get into how you can copy their success, let’s talk a little bit about what 404 pages are and why you should care. Links eventually go bad. Products are removed. Content is deleted. Permalinks get changed. Nobody wants to see a page like this. Not just because they’re annoying, but because they’re also nondescript and don’t provide any reason for people to stay on the page. Make your 404 pages reflect your brand. So how can you effectively brand your 404 papes to engage customers and reduce bounce rate? 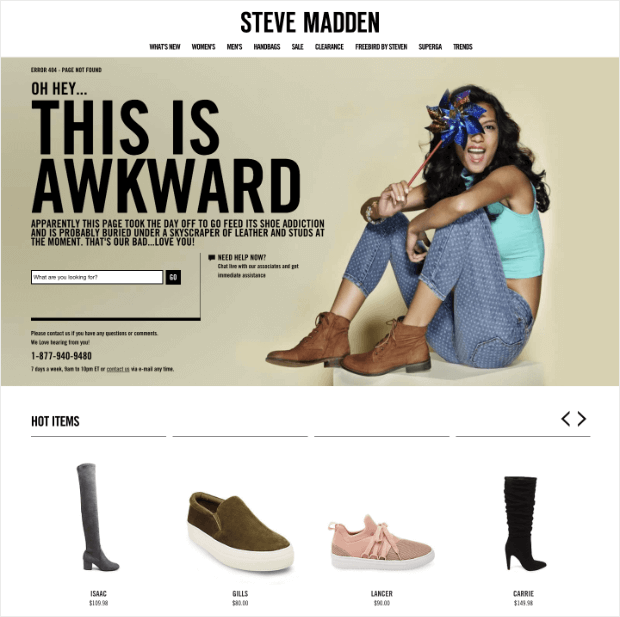 Read on for 3 ways you can set your error pages up for conversions. 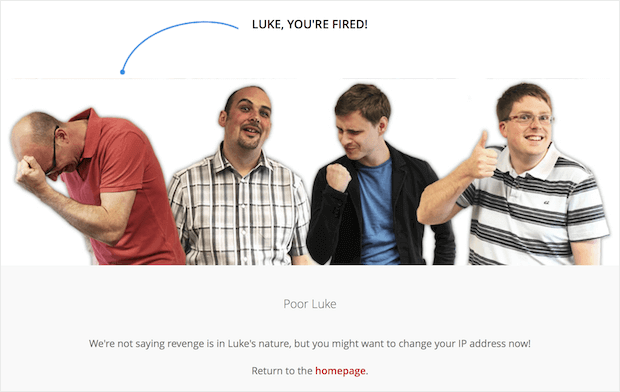 Email Center UK takes all of the blame from site visitors by giving them a fun way to work out any 404 page frustrations they might have. The two-part 404 page increases engagement by getting visitors involved in “firing” one of the developers. This 404 page strategy provides the company with a creative way to apologize for the inconvenience. It’s clever. It’s funny. It’s branded, and purposeful. The company has successfully turned a frustrating experience into a fun, interactive one, encouraging the visitor to hang around longer and click on the highlighted link to the homepage to further explore the site. While this brand’s 404 page offers up a humorous apology, it also gives visitors instructions on what to do on the page by providing a product search box. Links to popular products cleverly distract visitors from what could otherwise be a very annoying experience, encouraging visitors to continue browsing and shopping. Additionally, it offers several different ways the visitor can get help (phone number, etc. ), which lets visitors know that the company is ready to listen and assist. The last thing the brand wants is for people to consider any time spend on their site as time wasted. By providing a marketing lesson on the 404 page, they are placing relevant information in the hands of their visitors, they are building relationships and making lots of conversions in the process. Another way to use 404 pages to increase conversions is to offer discounts and other promotions. For example, HostGator offered a 1 cent hosting promotion on their error pages for many years. Discounts are a strong incentive for visitors to continue shopping on your site after being let down by an error page. If your website is like most on the Internet today, you’re losing visitors on your 404 pages. That means your broken links—or deleted pages—could be hurting your brand and losing you money. We know…404 pages aren’t as important as other pages on your website. But that doesn’t mean they can’t add value. While it may take some time to design and test them, once 404 pages are branded and optimized, your company can enjoy reduced bounce rates, increased conversions, and additional sales. Done right, branded 404 pages can be effective tools that turn lost visitors into loyal customers.